Supreme Air provides Air Conditioning, Heating and Plumbing Services, Repair, Installation, Maintenance, and Tune Up in Marriottsville, MD and surrounding areas. 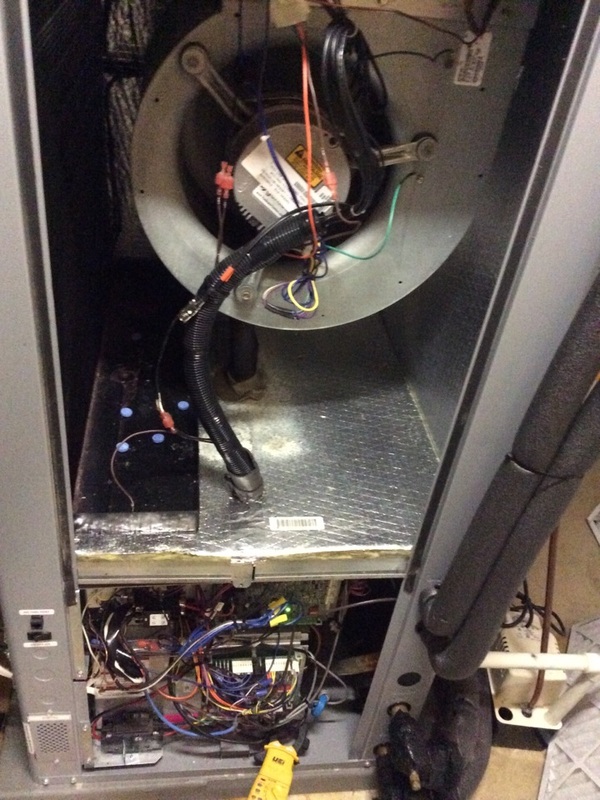 I operated the unit on cooling mode and measured 20+ degree delta temperature across the evaporator coil. Evaporator coil is very clean. I cleaned the condensate pan and drain lines and flushed with hot water. I checked the electrical wiring and electrical systems, all are within specification. Unit operating normal. I gave the customer a price to move the thermostat wire 4 feet over on the same wall. I used a lower price code but customer had been told by a contractor that it was very simple to do and could be done for $40. I explained all that would be involved and that it would take about an hour to do. Customer not going to relocate the thermostat at this time. I cleaned the condensate pans and drain lines and flushed with hot water. I checked the electrical wiring and electrical systems, all are within specification except for the voltage absorption system for unit #1. I replaced it with same rating run capacitor. Both units have 20+ degree delta temperatures across the coils. I confirmed proper flow rate and heat of rejection and pressurized the ground loop to 65 psi. Unit #1 would not go into cooling mode at first due to some electrical interference in the wire harness caused by the True Steam wiring. I remade the wiring connections and it began cycling. Both units are operating normal. Spring pm on 03/25/19 On arrival set unit to call for cooling measured supply and return air temp measured voltage and amps inspected electrical connections checked drain and cleaned checked filter checked water pressure unit tested unit operating normal at this time. Performed Operational Inspection on all units. Replaced filters. Inspected belts, blowers, coils, and heat exchangers. Checked all electrical components. Systems were in heat mode so let them come on naturally then satisfy naturally. All pilots are lit and Thermocouples in good condition. Units operating normal. On arrival checked thermostat operation, thermostat was calling for heat. We inspected both units in the attic, replace filters, inspected electrical connections, change a belt, and inspected heat exchanger. Units are operating normal. Performed heating pm on 3 furnaces. Replaced all filters and belt (9) 20x22x1 and (1) A55. Inspected coils and blowers, all clean. Flushed out drain with brush and hot water. Found furnace 2 pilot out, relit and furnace operated normal. Recommend to replace thermocouple. Preparing quote. Ran all furnaces and checked operation. Measured amp draw of all blower motors. Checked gas pressures and heat rise. Inspected heat exchangers and cleaned burners. Because furnace 2 hadnâ€™t been running, there was a slight burning smell when firing up. Informed customer that it will go away shortly. Heat exchanger in good shape. All units operating normal at this time. Performed pm on both geo systems. Washable filters are clean. Coils,and blowers are clean,. Flushed out drains with brush and hot water, tested condensate pump. Checked capacitors and contactors. Packaged system capacitor out of spec, customer declined replacing. Flushed out humidifier canisters and loaded with new water. Tested operation. Found top floor humidifier outlet gfi was tripped. Customer mentioned that it happens from time to time but believes the humidifier isnâ€™t the cause because it trips in the summer as well. Ran aux heat and measured amp draw and heat rise. Ran HeatPumps and measured amp draw of compressors, blowers, and loop pumps. Measured delta loop pressures and temps as well as delta air temps. Both units operating normal. Suggested customer get spare humidifier canister for future use since they wear out over time. Completed heating maintenance. Found that the package unit capacitor is weak and needs to be replaced . Costumer approved estimate . I replaced the units filters. I confirmed proper flow rate and loop pressures. I operated the units on auxiliary heat and second stage heating mode. I decreased blower speed in the split system to increase temperature rise to decrease units run time. Electrical wiring and electrical systems are within specification and both units are operating normal.